I'm starting a new series of posts today: a discussion of the Hebrew words for colors. Colors are particularly interesting to discuss from a linguistic point of view. First of all, it is logical that the names for colors should be connected to objects of the same color (I suppose "violets are blue" would be the exception, so I'll stick with "Violet, you're turning violet, Violet!"). Secondly, there have been many studies about how the awareness of colors develop with the progress of civilizations. (See Cecil Adams' classic article here, and for a Jewish point of view, see this post by Rishon Rishon and this discussion on the Avodah list.) 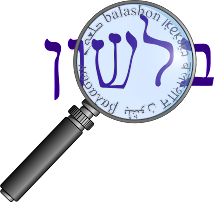 So we can see the colors used in the Tanach, the Talmud and then in Modern Hebrew. I'll start by reviewing colors used in Modern Hebrew (of course some of them have more ancient roots). Today we'll discuss adom אדום - red. I'm sure many people have noticed the connection between the words adom, adam אדם - man, dam דם blood and adama אדמה - soil / ground. Klein writes that they are indeed related, and provides the following development. From dam we get adom - according to Klein meaning "the color of blood". Adama (ground, soil, earth, land) derives from adom - originally meaning "the red arable ground". Lastly, adam, Klein writes, properly means "the one formed from adama אדמה, the ground." He points out there is a similar development in Latin, where homo (man, source of "human") is related to humus (ground) - the source of exhume (to take out of the ground) and humble (lowly, "on the ground"). From adom, we get such words as odem אודם - lipstick, maadim מאדים - Mars (the red planet) and the nation of Edom. According to Rosenthal, the term adumim has two meanings in modern Hebrew slang: a) fans of the teams belonging to the sports association HaPoel, or b) a slightly old-fashioned term for leftists.